Access to health care and improved health outcomes for rural populations plagued by higher rates of obesity and mortality from diseases like diabetes, heart disease and chronic obstructive pulmonary disease are benefits coequal to the economic advantages resulting from health care facilities located in rural communities. 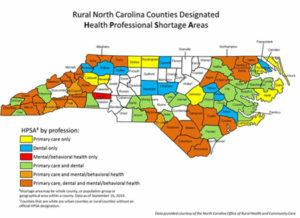 But, as stated in the August 2014 issue brief of the North Carolina Rural Health Action Plan: A Report of the NCIOM Task Force on Rural Health, “despite overall growth in the primary care workforce in the last 30 years, many of North Carolina’s rural counties face persistent primary care shortages.”2 Health Resources and Services Administration and other health workforce data further show that these shortages are not only limited to primary care practitioners—medical doctors, doctors of osteopathy, nurse practitioners and physician assistants—but also include general surgeons in primary care, dental and behavioral health professionals, and other highly skilled health care workers in these same rural areas of the state. 1 Scorsone, Eric. “Health Care Services: Three Critical Roles in Rural Economic Development.” Economic and Policy Update. Kentucky Rural Health Works Program. Vol. 01, No. 13, October 2001. Web. 11 Nov. 2014. 2 Rural Health Snapshot 2010. [Data tables updated August 2010]. North Carolina Rural Health Research and Policy Analysis Center at the Cecil G. Sheps Center of Health Services Research. Web. 11 Nov. 2014. Aid the development or expansion of innovative, community-based health care delivery models that help create jobs for and retain health care professionals and highly skilled health care workers in rural North Carolina especially HPSAs and PHPSAs by supporting collaborative models between employers of health care workers and educational or training institutions. Application Deadline has ended. Applications were due February 2, 2015. If you have questions regarding Golden LEAF or the Health Care Workforce Initiative, please contact Terri Bryant Adou-Dy or Ted Lord by email or call 252.442.7474 or toll-free 800.684.8404.